uCoz and WordPress are quality and professional web building tools, which have a rich diversity of functions, features and options that make each system stand out from the crowd in its own way. In fact, it’s impossible to define the distinct leader right from the start. Each service has much to offer and each of them centers around a particular web building objective. Such situation has triggered the necessity to review and compare uCoz and WordPress to find out their major characteristics and implications. uCoz – is a powerful and quite popular website builder, which is one of the oldest representatives of the web design industry, being launched in 2005. The system appeals to users because of its functionality, flexibility, universal nature and convenience. It’s popular with webmasters aiming at the monetization of their products as well as among ordinary users. WordPress – is a world-know free open-source CMS, which does not require any presentation. The service is known to all experienced web designers, who have an intention to launch serious projects with long-term perspectives. The CMS was initially created as a blogging platform, but it managed to withstand tough niche competition to be now applied for multiple web building needs. 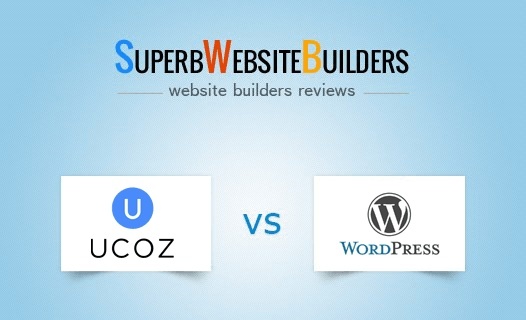 Considering the increasing demand of users for these website building tools, we have decided to compare WordPress vs uCoz. Which of them will feature exceptional ease-of-use combined with high performance, reliability and functionality? Which of them will work better for various target audiences? It’s high time to unveil the secrets of both systems now. uCoz. The website builder will work best for users, who are interested in the creation of different types of simple-to-complex projects. These include business websites, blogs, portfolios, landing pages, promo sites, online stores, portals, newsfeeds and what not. It might also be interesting and simple enough to the representatives of creative professions, freelancers, entrepreneurs, whose web design experience may differ a lot. Whether you are a pro in website development or have just started the career, uCoz may be the right choice to adjust to your needs and style. Unlike the competition that’s mostly intended for those of us who are HTML-illiterate, uCoz targets both end users and web professionals (designers, developers, and entire agencies), as its feature set includes both the DIY and ‘professional’ editors. The control panel of the service is quite user-friendly and it doesn’t take much time to get used to it. However, it is somewhat simpler as compared to those offered by some contemporary website builders. You won’t find a standard WYSIWYG/drag-and-drop editor here, but this is not a serious problem for those, who have chosen the service to build professional websites with it. This just means that the platform implies a slight learning curve to get the most out of its use, which may obviously take some time. uCoz may seem complicated at first glance, but once you understand its logic, you’ll realize how smart and flexible the system is. Building a site with uCoz starts with creating an account, choosing a domain name instead of the subdomain offered by default and setting up the website characteristics in the system’s wizard. The next step implies module selection and website customization that depends on your needs. Thus, there is nothing complicated about mastering the system – it just requires a bit more patience, effort and time to get used to its specific web design approach. WordPress. This is the open-source blogging CMS, which looks comparatively understandable and simple at first sight. The service makes it possible to create various types of projects, even though, its initial area of application web down to blog building. Much attention is given to details of posting options as users, who give preference to it, frequently have an intention to create content-rich websites that are frequently updated with text materials. It may initially seem that WordPress dashboard is simpler and more intuitive than that offered by uCoz. Right after you install the system and start exploring the control panel and the variety of sections it involves, you realize that the service is much more complicated than it initially seems. This is especially true for newbies, who need more time and effort to cope with the entire spectrum of its intricacies. Users need a wide assortment of skills to reveal the functionality of the system. Newbies can also use it, having read a couple of manuals, forums and YouTube video tutorials, but they will hardly be able to build websites that would be more complicated than an ordinary template-based promo website. Even such a simple CMS as WordPress requires professional approach to develop serious projects. The major problems one may face here are hosting, plugins and safety issues. Speaking about the plugins, you just won’t be able to get the most out of using the service without them. This is because plugins help get the most out of the website performance, revealing the entire spectrum of features you plan to avail. uCoz vs WordPress. Of course, you could tinker with settings on both platforms for hundreds of hours, but just to get a website up and running, uCoz is the better option. WordPress, in its turn, also allows creating complex projects by means of additional plugin integration. Using the system is not quite difficult – this is the matter of a couple of days for those, who have an intention to use the system in future. uCoz. The website builder offers a broad spectrum of web building options, which are subdivided into two areas for the ease of use. These are general settings and module parameters. General settings are applied to adjust the entire website functionality and give it the required performance. Modules are added with regard to your personal preferences and web design objectives. There are many of them here, but you don’t have to use all the modules at a time. Instead, you can choose only those of them you will need for your project realization. It’s possible to adjust the amount settings in the dashboard on your own. Just add all the necessary elements and remove those you won’t need at all. Your uCoz-based website will look just as you want to. What you should know is that uCoz grants full control over the CSS and HTML website editing that contributes to deeper project customization. Mind, however, that when controlling your web design process via code editing, there is always a chance to spoil something and do harm to your website. So, if you lack programming skills, you don’t have to try learning and using them just because this might be a beneficial solution – the system allows for manual design customization via the application of website editing tools available in the dashboard. You are welcome to use them to customize the available ready-made system modules (Forum, Online Store, Chat Box, News Feed, Blog, Polls, Article Catalogues, Call Board, Social Network Posting, Guest Book etc.) prior to integrating them into your website. Apart from that, uCoz offers one of the best modules to manage the promotion of websites created with it. An opportunity to set human-friendly URLs, title and description meta tags for all materials/categories – this is not the full list of SEO optimization options the system offers. 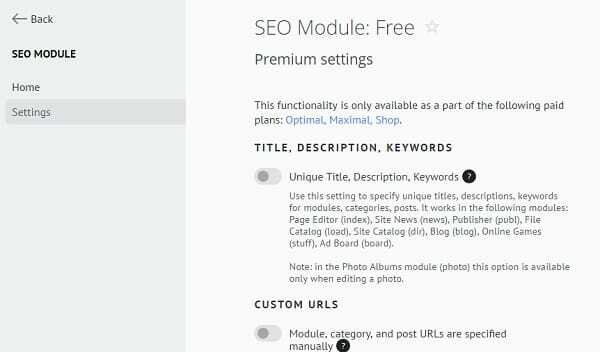 SEO module can also be used to monitor the positions, link purchasing etc. Another highlight you will certainly like is an opportunity to connect SSL Certificates to your websites to ensure maximum safety and confidentiality of personal and payment info. However, this feature will mostly come in handy, if you plan to launch an eCommerce website. There is also one notable feature that deserves to be underlined here. This is an opportunity of one-click activation of website version for visually-impaired people. This is a notable benefit for non-profit organizations that adopt a decision to create a website with uCoz. WordPress. The CMS offers a wide selection of features, design customization tools and options that make it possible to launch visually-appealing websites with excellent performance. Even though, the initial sphere of WordPress application once went down to the development of blogging websites, the service quickly developed into a powerful platform with a variety of features that can cover any web building needs. Content uploading and management is simple and quick here, while the system installation does not take much time and effort. The only nuance is that it’s hardly possible to go without programming skills here, if you intend to design a full-featured website. The same is about plugin and template integration. The thing is that the functionality of the platform depends a lot upon integration options. The basic WordPress version is quite poor, yet it has a collection of ready-made built-in templates and plugins. In most cases, this is not enough to ensure the result you plan to avail. Thus, you won’t go without adding extra plugins and setting up templates to give your project advanced performance and outstanding design. You’ll come across hundreds of variants on the web, which may be both free and paid. Whatever plugin or theme you’ll go for, make sure you deal with a professional web designer you can totally trust not to pose your website safety at risk. Another thing to remember is that plugin integration influences the frequency of project updates you’ll need to make after the website it completed and published. Plugins are updated on a regular basis and the more of them you use – the more often you’ll have to upgrade your website. This may be a challenge for non-techies. If you are a newbie, you’ll have to experiment by making your own plugin collection. You will also be able to edit the plugins manually, if you know PHP programming language. It goes without saying that you have to perform all the code-associated actions having saved the copy of your website. Otherwise, this may end up sadly. As opposed to uCoz, WordPress installation requires the availability of pre-paid hosting. The choice is quite extensive, but it’s still not easy to make the right decision based on your website characteristics, terms provided and available budget. Reliable hosting providers like Bluehost, for example, offer a diversity of plans that cover the prevailing amount of web hosting needs. Keep that in mind, when choosing WordPress as the best web building solution. uCoz vs WordPress. While it may seem that WordPress is more feature-rich, uCoz still offers everything you need to set up a decent website. WordPress is undoubtedly a more flexible system since it’s an open source software, allowing for deeper website customization and application of coding skills. uCoz. The website builder currently offers over 20 template categories, which encompass more than 400 quality themes. For the ease of search and user convenience, all the templates fall into thematic categories that are updated on a regular basis. It’s hard to call uCoz templates modern and professional, considering the year of the service creation. The quality of the available designs, however, is on a decent level and may easily come up to various web design preferences. When browsing uCoz template collection, you can come across outdated themes as well as contemporary template samples, which have responsive design and outstanding look. It makes sense to give preference to newer templates, which are on the top of the list in each category. It’s better to select responsive templates, because they are newer, more appealing and can be browsed on any mobile and desktop devices. You can solve this problem by visiting the brand store of the system – uTemplate.pro, where you will find thousands of affordable samples to meet any preferences. You can also get a premium template of your choice from this collection by upgrading to any paid plan, starting with “Optimal”. Another option is to get a standard template and customize it to your liking. uCoz offers extensive design customization options. The website builder places a strong focus on website design editing options. So, it’s possible to upload your own template, edit the code in the ready-made sample, replace the sections in it or create your own design from scratch in the website builder. This is how you can avail the design of any type and complexity level with uCoz. All in all, the website builder has broad options in terms of interface design creation. This is one of the best systems in this respect, but you will not go without basic HTML/CSS knowledge to complete the majority of operations. It’s more beneficial to upgrade the plan to get an appealing and unique bonus template as well as other useful features. WordPress. The CMS makes it possible to change template designs in the settings right from the start. There are 3 available options here, but you can additionally choose between thousands of design variants as well. You can use lots of search filters, sorting them out by color, functionality, layout and theme. We recommend choosing the templates by filling out the required features in the filters, because this will affect the possibility to integrate the required functionality without any coding. Mind that WordPress templates may be free and paid, which may affect your choice based on the budget, topic and style preferences as well as on general web design objectives. The designs, however, are quite similar, which lets the application of HTML/CSS coding skills a huge benefit. Customization options mostly depend upon the activated template: each of them may have extra settings that are not available in the stock variant. The amount of settings is usually extensive: general, layout, editor, typography, slider, lightbox, menu, color scheme, home page etc. Having selected the most suitable template, you will avail great result, which is easy to edit in case of necessity. 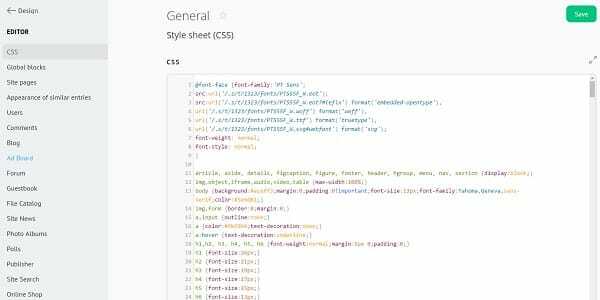 If you can’t find the required template in the basic WordPress collection, you can surf the web to get a pre-designed theme there. These themes can be integrated into your website on a free or paid basis depending upon the option you prefer. Being developed by third-party experts, they may also differ in quality and safety. So, make sure you deal with a credible web designer not to mess everything up. uCoz vs WordPress. 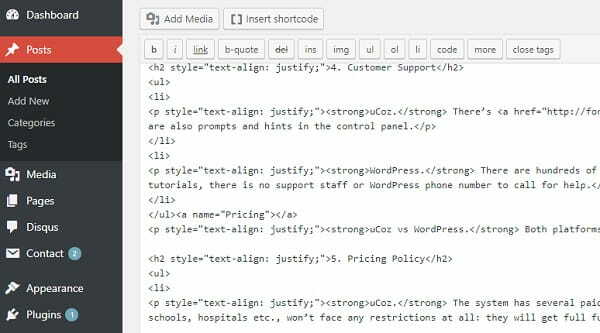 As far as neither uCoz nor WordPress support WYSIWYG editing of their templates, both systems imply at least a rudimentary knowledge of HTML/CSS basics. The good news is that you can completely rebuild any theme to get the desired look, if you’re handy with codes, of course. While uCoz templates are integrated by default, WordPress themes may also be available on the web. This somewhat extends your choice, yet requiring more attention. uCoz. The customer support of the website builder is not quite extensive, but it is enough to provide the basics of using the service. The customer support grants access to multiple manuals, articles, email assistance, video tutorials and step-by-step guidelines that cover all the stages of the web design process. The real advantage of the website builder is its large Community Forum, which is the highlight of the service. Being created long ago, uCoz has gained worldwide popularity with users, who are ready to share their knowledge and answer the questions of newbies here. You can also come across helpful recommendations, hints and prompts available in the control panel of the service. As far as the website builder currently has around 16 language localizations, it provides support in several languages, including English, Russian, Portuguese, Romanian, Hungarian, and Ukrainian via a ticketing system. The same languages may be chosen when reaching the Community Forum of the system. WordPress. As the open-source CMS, WordPress doesn’t offer any customer support assistance at all. However, the prevailing amount of users’ needs are covered in the powerful and large WordPress community, which comes with lots of forums, official tutorials, video lessons and FAQs that help newbies get answers to their questions and explore the nuances of working with it by reading the stories and recommendations of users. Direct or live customer support is not available in WordPress, which is a substantial drawback of the service for most users. WordPress vs uCoz. Both platforms have impressive and powerful knowledge centers. However, email support (free and premium) is only offered by uCoz. WordPress, in its turn, boasts a stunning user community with lots of forums, guidelines and FAQs to help newcomers get along with the system and learn its nuances. uCoz. The system has flexible pricing policy, which allows users to choose the plan that works best for their particular needs. There is a free plan, which makes it possible for first-time users to test the entire feature set and select the best option afterwards. The free version is never-expiring and it doesn’t imply the provision of the credit card data. One of the undeniable advantages of the website builder is the opportunity to launch a free website for non-profit organizations, making use of the feature set used in terms of the paid plans. Whether you are going to create an educational website, a church site, a hospital website or a web project for your charity organization, get in touch with the support service of the website builder to provide the required documents (or other proofs) and get a full-featured website devoid of ads. As to the paid subscriptions, their number currently constitutes 5 plans. The cheapest subscription will cost you $2.99/mo, while the most expensive offer will cost $9.99/mo. A user can get a 50% discount on any pricing plan during 48 hours after the registration. Anyone can get it – you just test the system for as long as you need, then create a new website and get the discount. What’s more, uCoz frequently offers bonuses and special offers and it is also possible to cut down the cost of the paid subscription by paying for 3-6 months or even a year and more in advance. WordPress. This is a completely free service, which does not require any payments for downloading, installation and further website management. Your CMS usage expenses go down to the cost of plugins and templates that are not available in the dashboard store (paid plugins are generally connected with an online store or website promotion). All plugins and templates available in the dashboard are free. The choice is versatile and impressive. Additionally, you’ll need to invest into domain name and hosting – WordPress doesn’t provide free options here. Mind that the more plugins you install, the stronger the hosting load will be. Consequently, your website may work slow, which will have negative effect upon its traffic. That’s why, it’s recommended to get quality hosting, especially if you aim at developing large-scale projects. One of the best solutions is BlueHost, which is the official WordPress hosting provider recommended by the service. It offers several plans to come up to various needs, website size and specialization as well as the budget you plan to invest into the project. The cheapest Bluehost plan will cost you $2.95/mo only, while the range of features it implies will definitely impress you. To sum it up, the cost of using WordPress (including the paid template, plugins, hosting) is almost equal to that of uCoz. uCoz vs WordPress. Quality matters, especially when it comes to business websites. Building a quality website with uCoz appears to be less expensive as compared to WordPress. The website builder has a free never-ending plan, while WordPress is absolutely free for all users and project types. However, it additionally requires hosting, domain name, plugins and templates that are often quite costly. Thus, both systems imply certain financial investment for users willing to create and manage full-featured websites. The decision to choose the best website builder to match a broad range of web building needs is not an easy one, but this is exactly what users face when deciding to start a website. uCoz and WordPress are decent web building systems, each of which deserves user attention and can be applied to complete a myriad of tasks. uCoz is the “old generation” website builder, which was launched in 2005 and has not lost its reputation since that time. On the contrary, this all-in-one platform comes with multiple design customization, web development and promotion tools that allow creating different types of projects for personal and commercial use. It’s the ideal variant for non-profit organizations due to the absence of any fees. It’s definitely recommended for a broad user community. WordPress is the most well-known CMS, which is intuitively simple and convenient to use, yet it requires awareness of basic coding nuances. WordPress flexibility is theoretically unlimited, but it is realized by means of plugin setup. To get the most out of using the service, you’ll need to install free or paid plugins provided by the third-party designers. Which service still works best for proficient web designers and for newbies? There is no the only distinctive answer to this question as each of them comes with specific feature sets and is oriented on the completion of certain tasks. WordPress CMS is a world-renowned web building tool, but uCoz is a perfect alternative to it. This is especially true, when it comes to the feature set, design customization and pricing options implied. It’s up to you to make the final choice by testing both services!